What is a Steam Donkey? A Steam Donkey is a portable steam engine equipped with cables and one or more revolving drums that found a score of uses in the industry, particularly in yanking felled logs through the weeds to a central collecting yard. 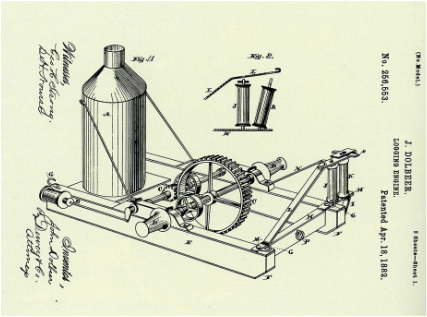 Invented by John Dolbeer in 1881, the Steam Donkey revolutionized the logging industry in the northwest. Dolbeer developed a small, high-pressure steam engine to turn a rope spool which could reel in even the largest trees with ease. At first the mechanical donkeys were used to haul logs from the forest to the bull teams waiting to pull them down the skid roads en route to the mill ponds where they would wait to be processed. Later, when rope was replaced with steel cable, the bull teams were completely replaced by this powerful new invention. In order to operate the donkey, three men, a horse and a boy were needed. The line was first attached to a horse and pulled through the forest to the site of a freshly fallen log. A choker setter was responsible for attaching the line to the fallen tree, a spool tender would use a short stick to guide the line back on the spool, and the donkey puncher operated the steam engine throughout the process. The boy, referred to as a "whistle punk," operated a communication wire which would sound a steam whistle when the choker was properly set on the log, signaling the donkey puncher and spool tender to begin pulling it in. Steam donkeys evolved over time and were used in all aspects of log transport in the timber industry, such as guiding log rafts of logs downriver, replacing bull teams on the skid roads, and lowering logging trains safely down steep inclines. Dolbeer's Steam Donkey continued to be the industry standard until it was rendered obsolete by improvements to the internal combustion engine in the early 20th century.